information about invasive plants in the area. > > > Poster 1, a sketch of the Lost River Mountains from Willow Creek Summit to Arco. 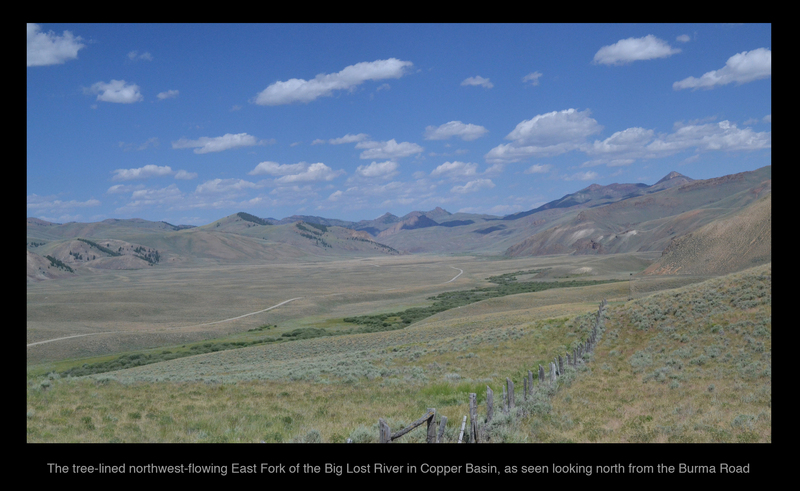 It also has lots of text about the Lost River Range, the Big Lost River Valley, Arco and Mackay, etc.. This document has hung on the wall at Pickle's for several years. It is available as a pdf and jpeg (an 8054x3600-pixel 18 MB file). 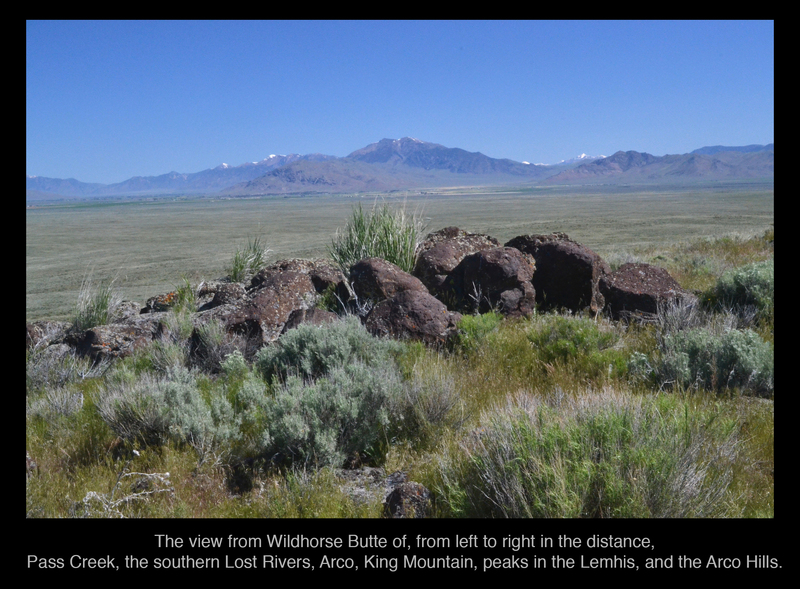 > > > Poster 2, a sketch of a panorama from Craters of the Moon to Arco, looking north to the mountains. It is available as a pdf and jpeg (a 7772x1175-pixel 2 MB file). > > > Poster 3, a sketch of a panorama looking north from the Twin Buttes and thus at the Lost River, Lemhi, Beaverhead, and Bitterroot mountains. It also has an explanation of their origin. It is available as a pdf and jpeg (a 7772x1720-pixel 4 MB file). 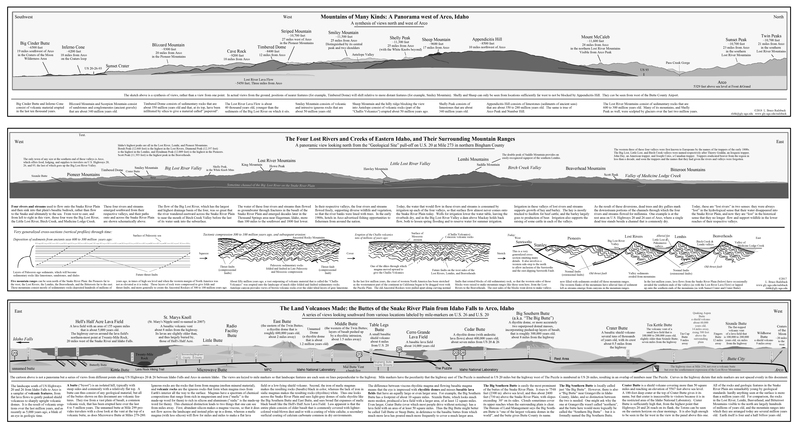 > > > Poster 4, a sketch of the volcanic landscape south of US 20 from Arco to Idaho Falls, with an explanation of its origin that is less long-winded than the one in Poster 5. It is available as a pdf and jpeg (a 7771x1260-pixel 4 MB file). 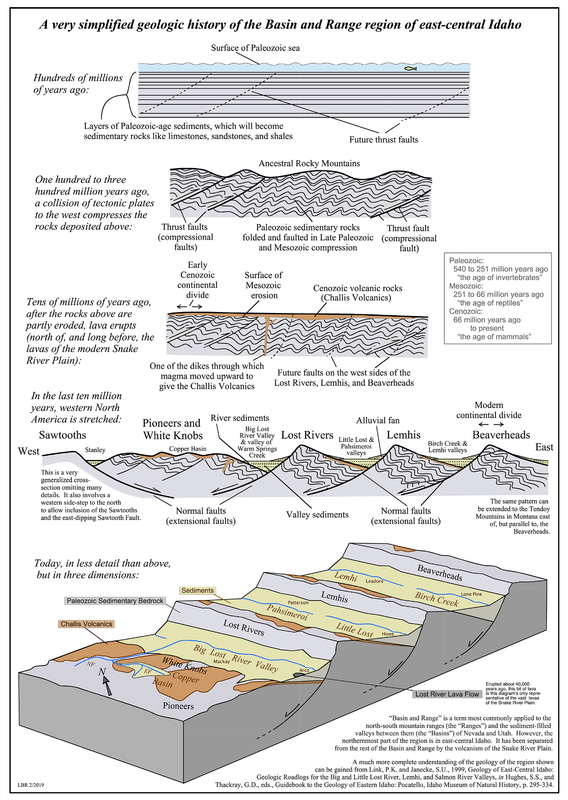 > > > Poster 5, a sketch of the volcanic landscape south of US 20 from Arco to Idaho Falls, with a more complete explanation of that landscape's origin than the one in Poster 5. It is available as a pdf and jpeg (a 7816x2193-pixel 7 MB file). 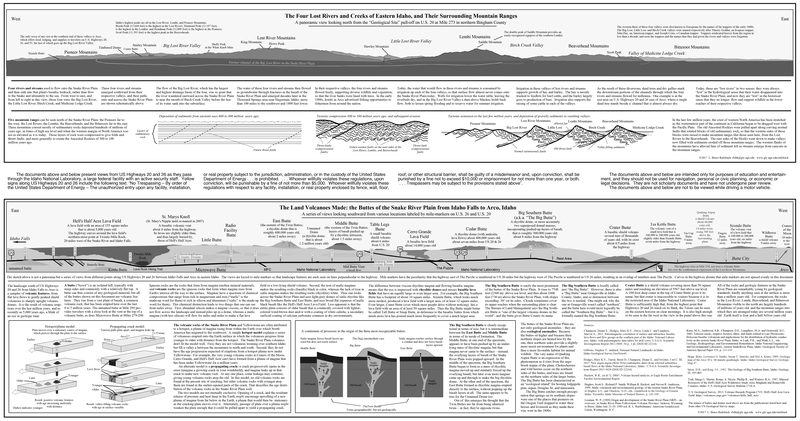 > > > Poster 6 showing the geologic history of Lost Rivers, Lemhis, and Beaverheads. It has the series of cross-sections also shown on Posters 1 and 3 and a three-dimensional sketch unique to Poster 6. It is available as a pdf and jpeg (a 1700x2409-pixel 2 MB file). There are also larger documents with combinations of Posters 2 to 5. For someone printing the posters, these Combo-Posters may be an efficient option. Photographs of the landscape in the Big Lost River Valley and the Arco Desert, in very rough order from north to south. The goal is to provide views from places that are not easy to access, but a few side-of-the-road beauty shots have crept in too. Unless otherwise noted, all images are less than 5 MB. There is also a base map labeling some of the places mentioned. 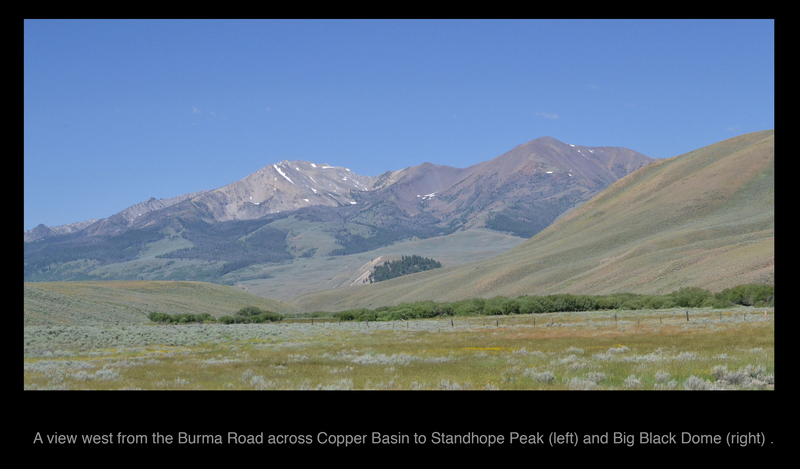 A view west from the Burma Road across Copper Basin to Standhope Peak. 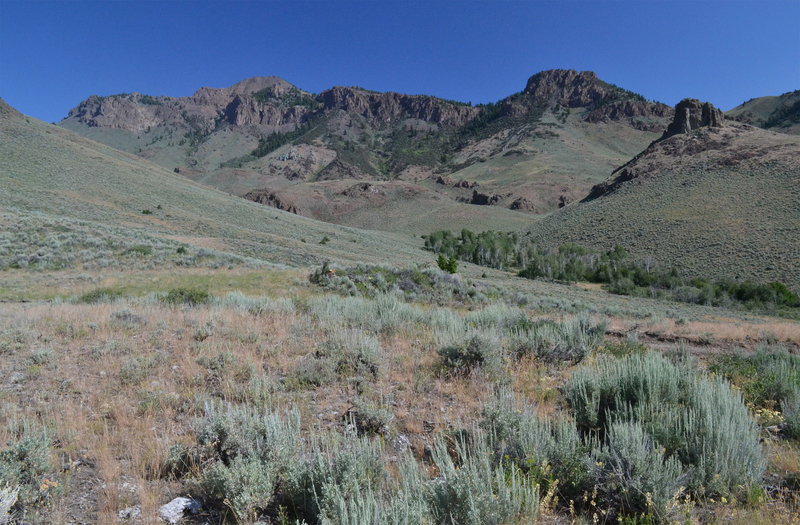 Three views of glacially sculpted valleys in western Copper Basin. 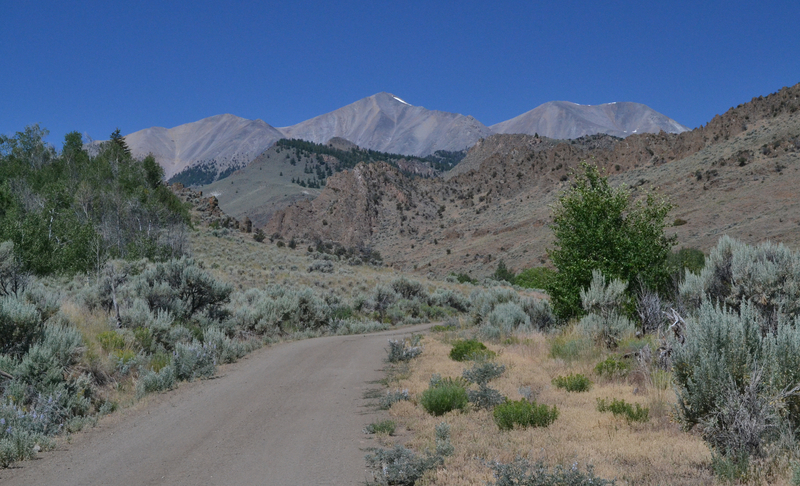 The tree-lined northwest-flowing East Fork of the Big Lost River in Copper Basin, as seen looking north from the Burma Road. 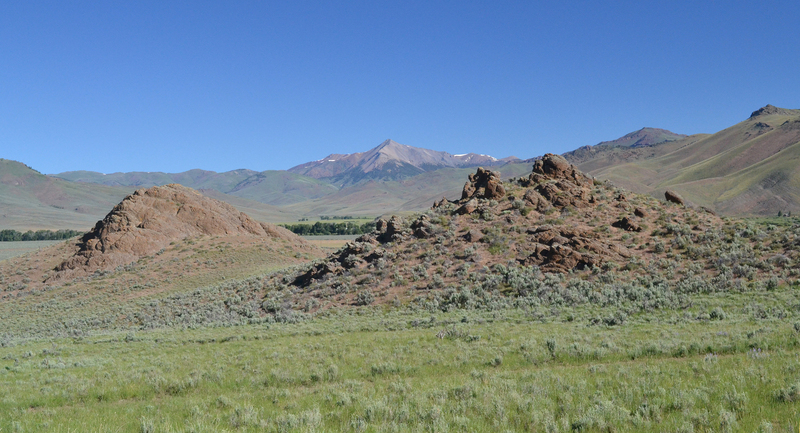 An apparent fault scarp on the east side of the East Fork, near the mouth of Copper Basin . Hopefully coming in the summer of 2019! 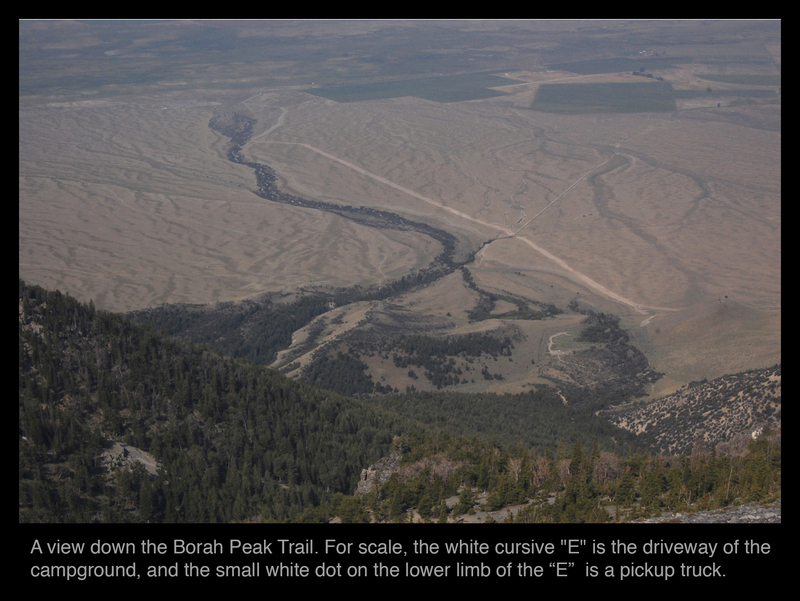 The Chilly Buttes and the northeast-flowing stretch of the Big Lost River along Trail Creek Road, below the confluence of the North and South forks, as seen looking southwest from the Borah Peak Trail. 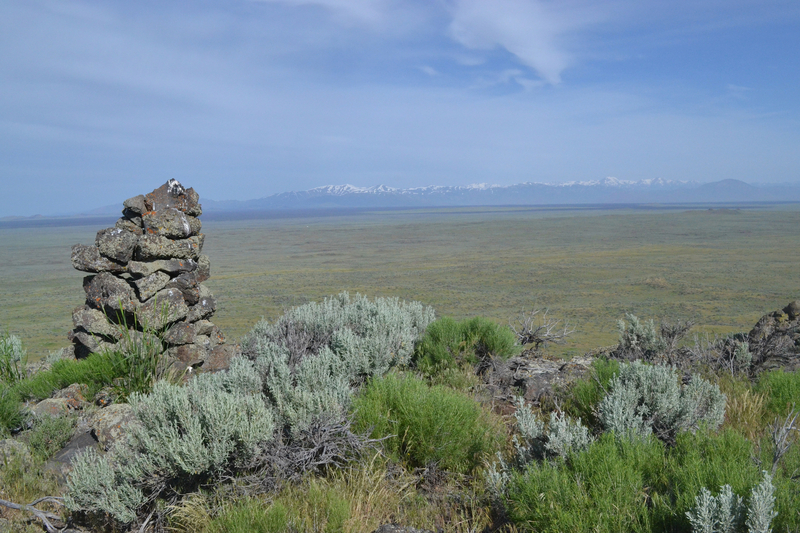 The White Knobs and the Pioneer Mountains seen from Willow Creek Summit in 2011. 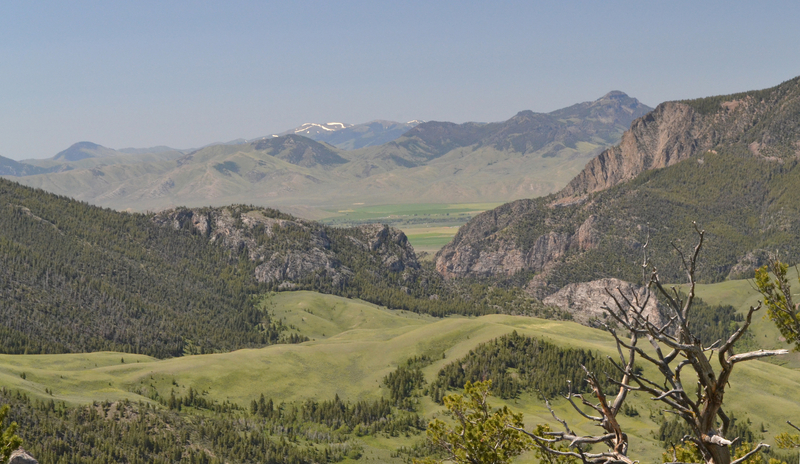 The northern Lost River Mountains from Willow Creek Summit. 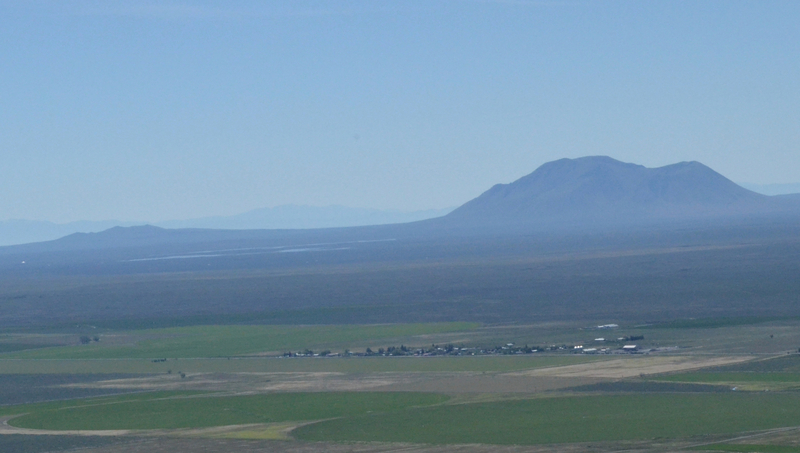 The northeastern Chilly Butte is at the far right. 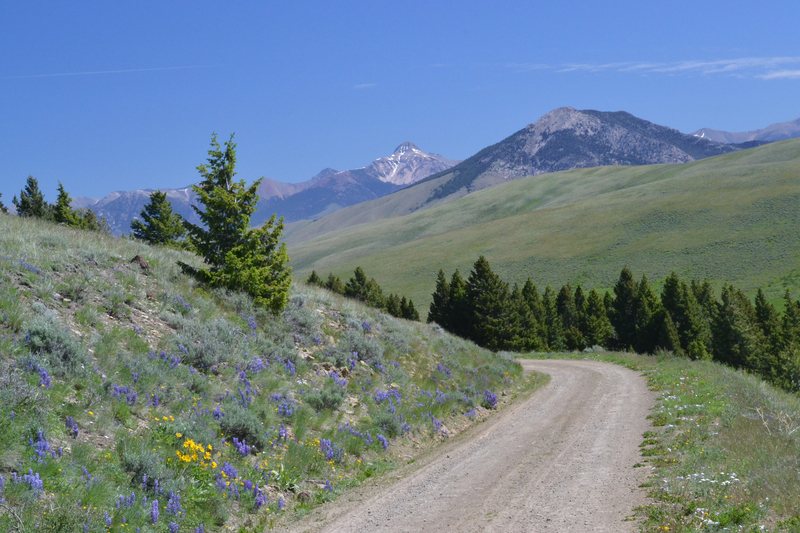 Dickey Peak in the northernmost Lost River Mountains, seen from the Doublesprings Pass Road. 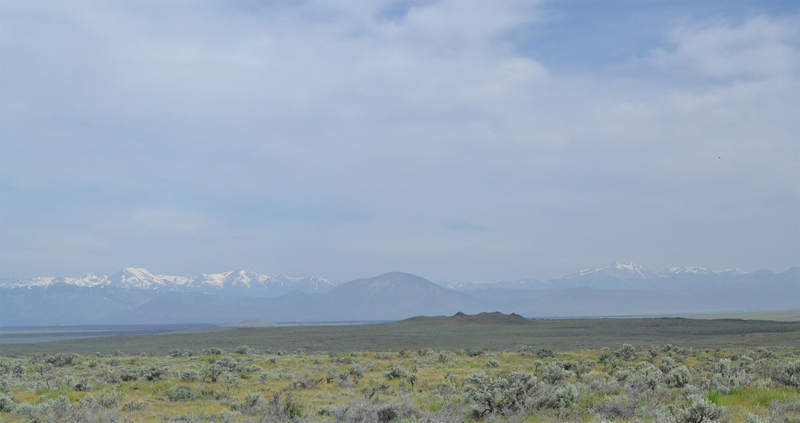 The view west from Double Springs Pass of the Chilly Buttes and the Pioneer Mountains. 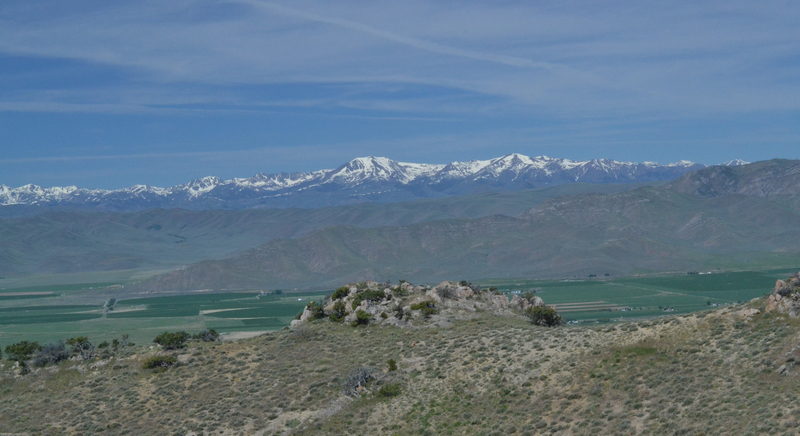 Dickey Peak in the northernmost Lost River Mountains seen from the Borah Trail. The northern Lost River Mountains seen from the old bridge to the Fish Hatchery in 2016, before the new bridge. The northern Lost River Mountains seen from the Burma Road and thus across the valley of the Big Lost River north of Mackay. 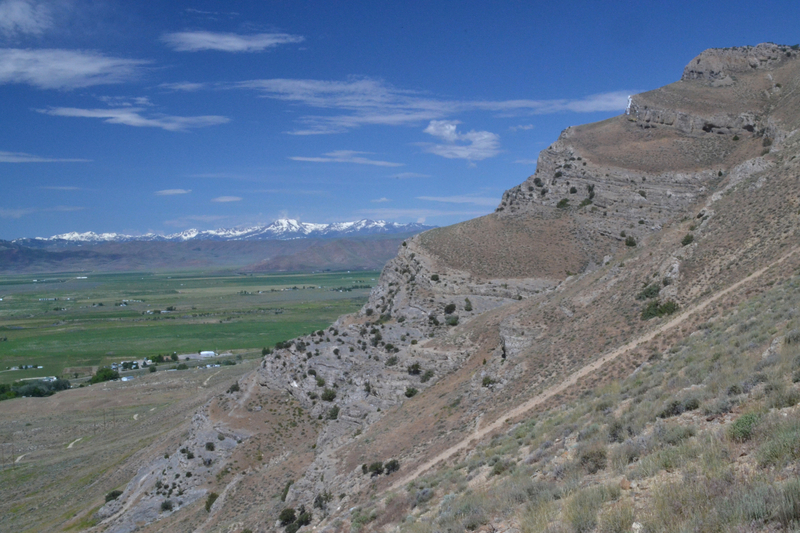 A view down the Borah Peak Trail. For scale, the white cursive "E" is the driveway of the campground, and the small white dot is a pickup truck. 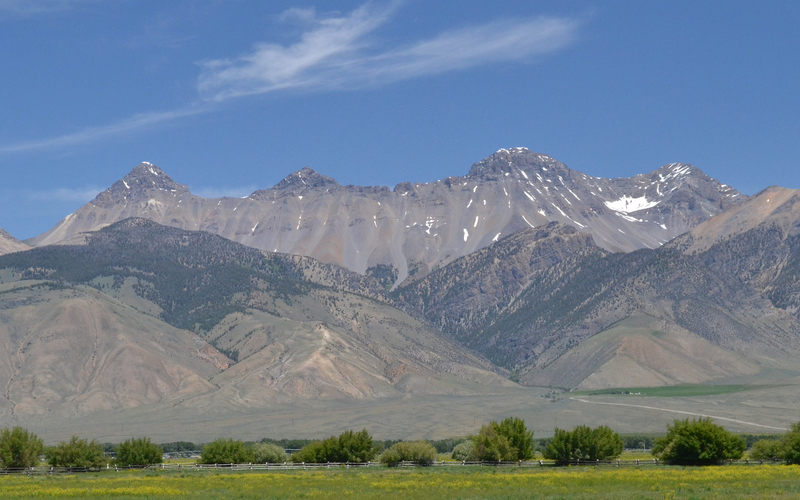 Leatherman Peak, Badrock Peak, and Mount Church in the northern Lost River Mountains. Mt. 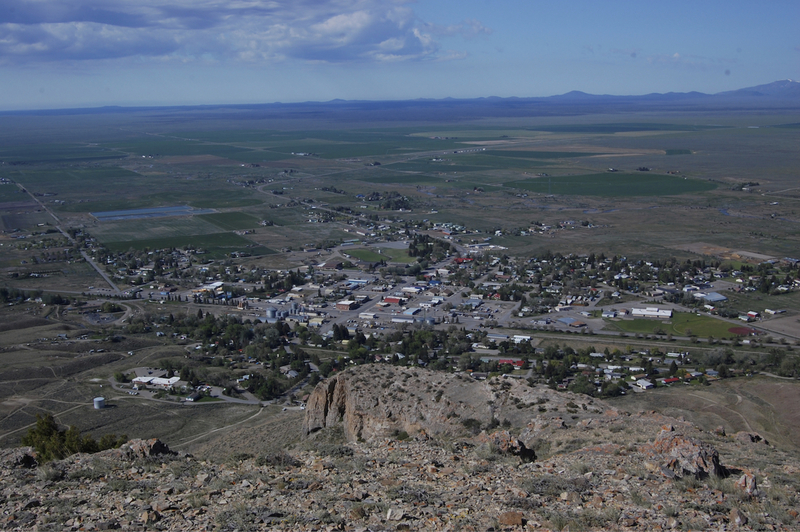 McCaleb seen from the mining district above Mackay. 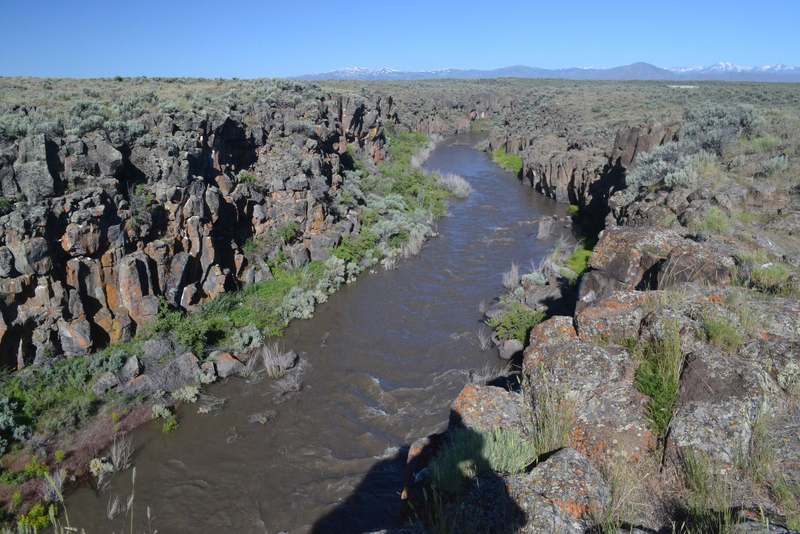 A view from above the mouth of Alder Creek looking west. Pointed Shelly and doubly rounded Redbird are to the left, and White Knob (the white knob) and pointed dark Mackay Peak are to the right, on a smoky day. The color of the left quarter is completely artifactual. The northern Lost River Mountains in snow in January 2016. Pass Creek is at the far right. 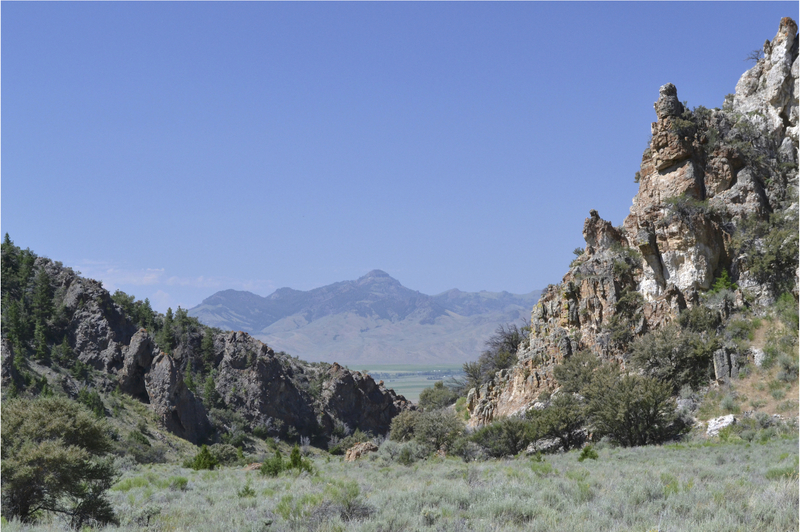 Layers of limestone in the Pass Creek Narrows. These layers were deposited as sea level repeatedly rose and fell about 300 million years ago. The view looking west from Blacktail Summit of Mud Lake and the Pass Creek Narrows. The view from Blacktail Summit looking west over the Pass Creek Narrows into the valley of the Big Lost River in the wet summer of 2017. 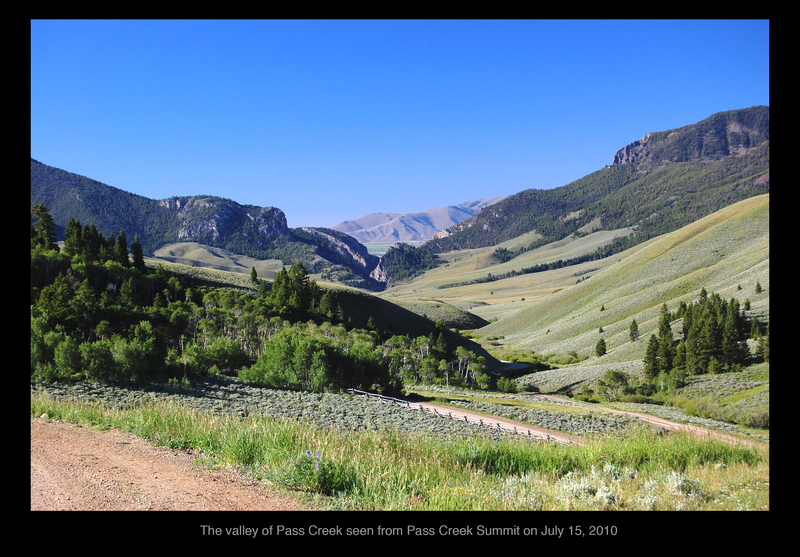 Pass Creek looking west from the summit to the narrows and on across the valley of the Big Lost River in 2010. 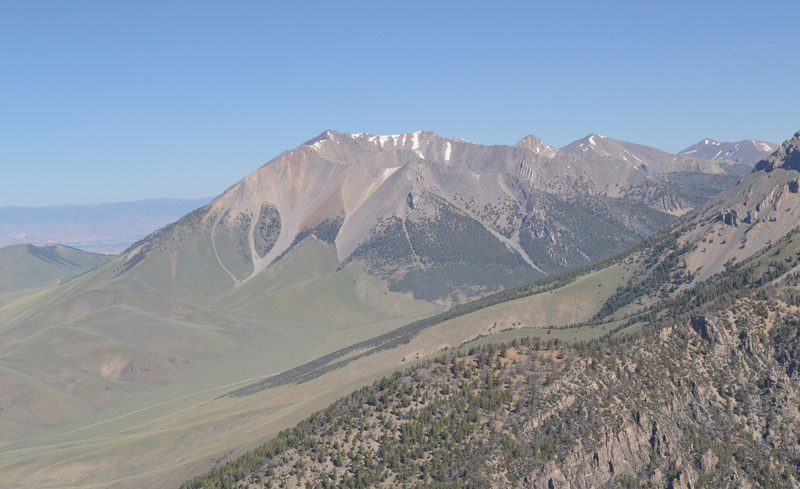 A view east from above Pass Creek Summit to Bell Mountain in the Lemhis. A wall of sandstone in Elbow Canyon. This wall consists of vertical layers that were horizontal when deposited. 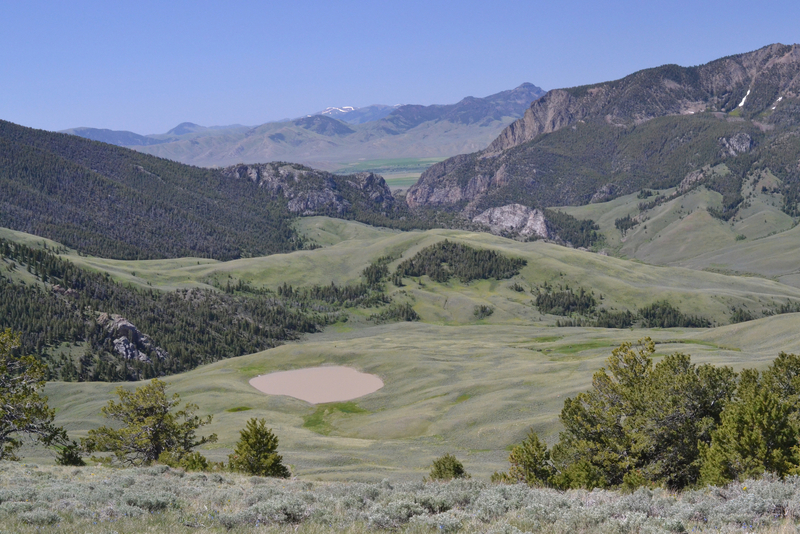 A view out of Elbow Canyon over the valley of the Big Lost River to Sheep Mountain . 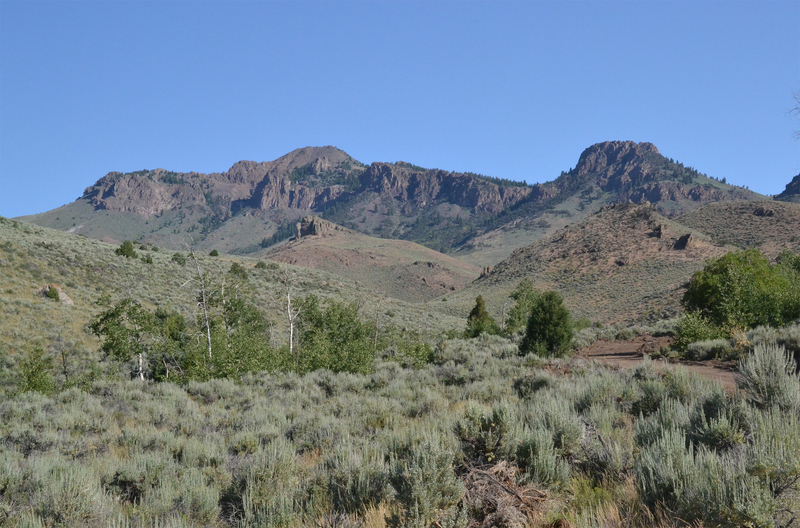 The southern Lost River Mountains seen from Alder Creek in summer 2016. 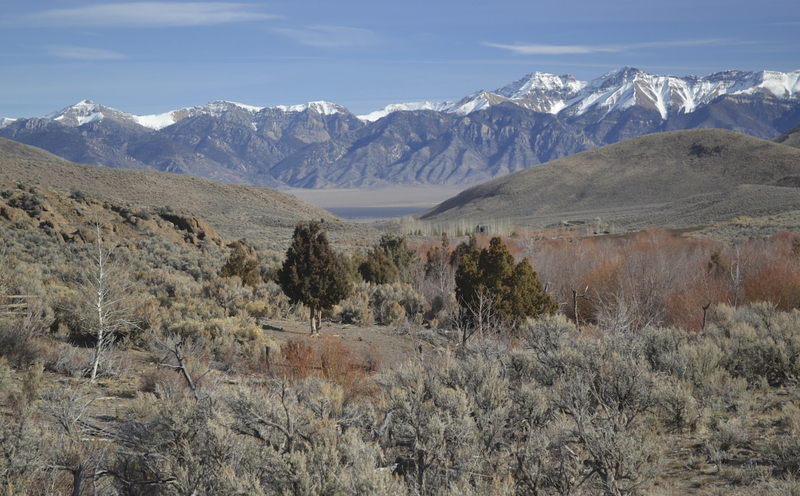 The southern Lost River Mountains seen from Alder Creek in November 2014. 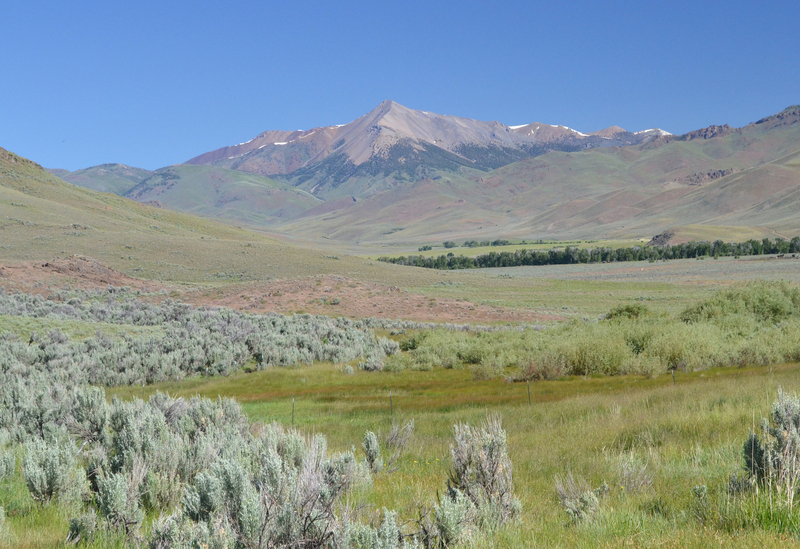 Shelly Peak from Alder Creek. Shelly Peak seen in snow from Houston Road in November 2014. Shelly Peak and two volcanic prominences in Antelope. Shelly Peak from the south side of Antelope. 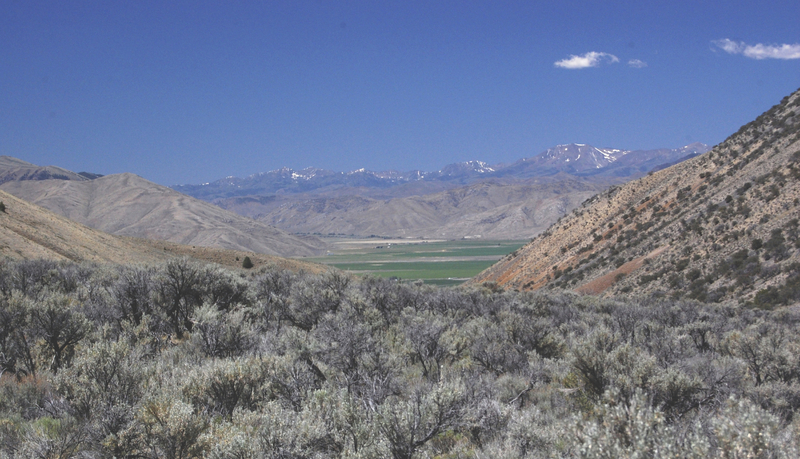 The view from Ramshorn Canyon across the Big Lost River Valley, with Smiley Mountain on the horizon at the right. 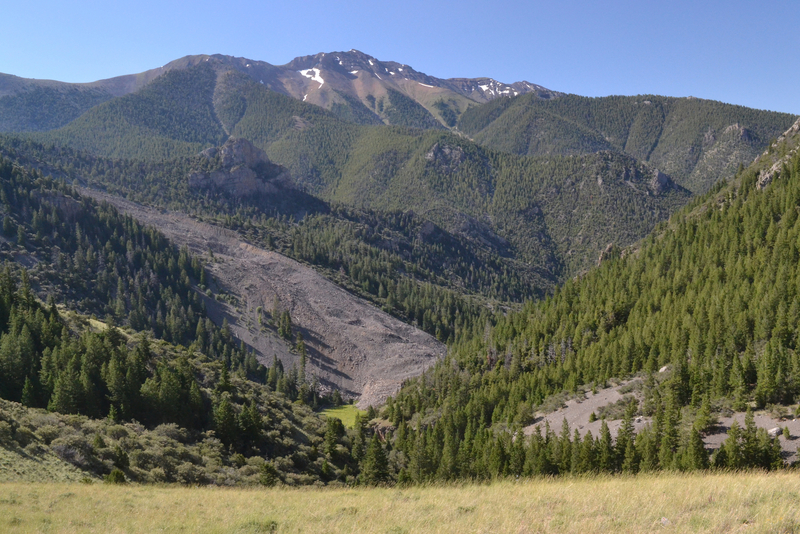 The landslide in Ramshorn Canyon and the meadow that has formed upstream from it. 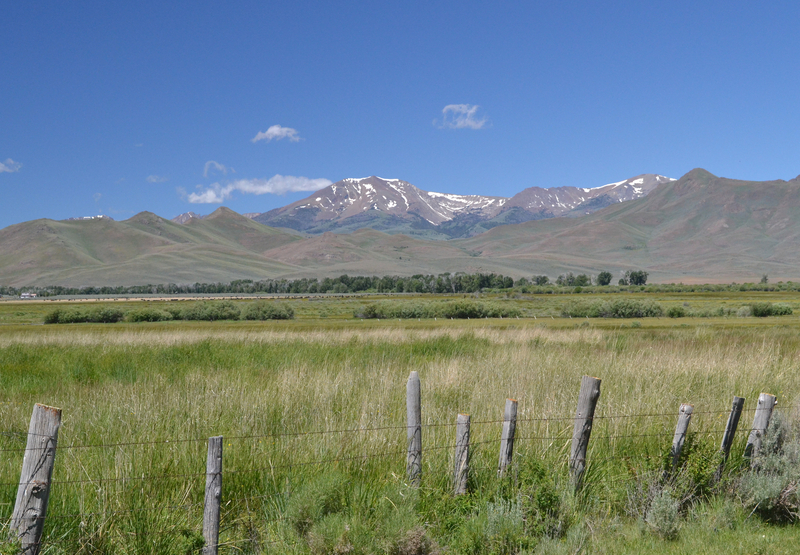 Sheep Mountain from Alder Creek (from the north). 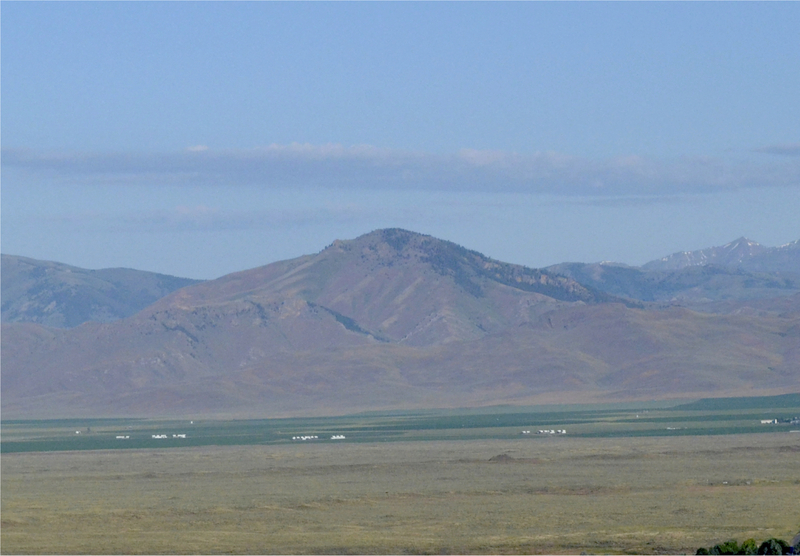 Sheep Mountain from the southeast (as commonly approached on the Waddoups Canyon Road). Sheep mountain from the south. Smiley Mountain and the meadow of Antelope Valley . King Mountain seen from the eastern (Little Lost) side. 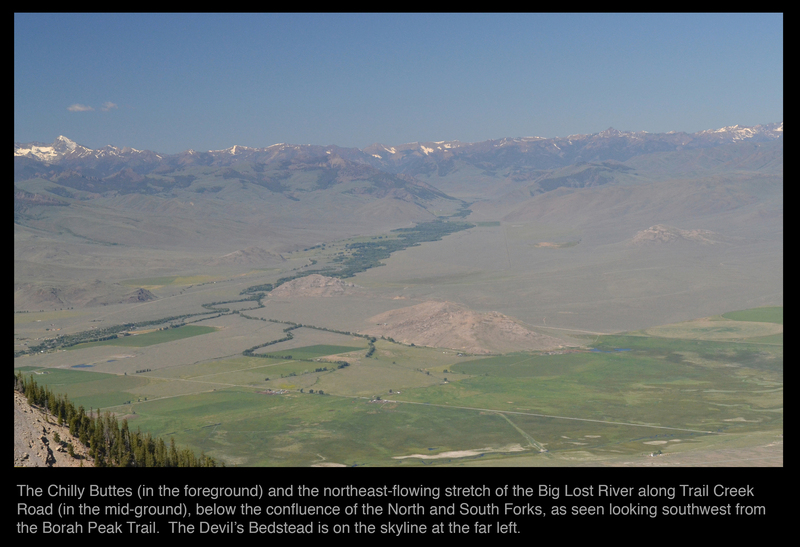 The Big Lost River Valley seen from Beverland Pass in 2009. Shelly is the grey peak to the right, and Sheep is the dark one in the center. 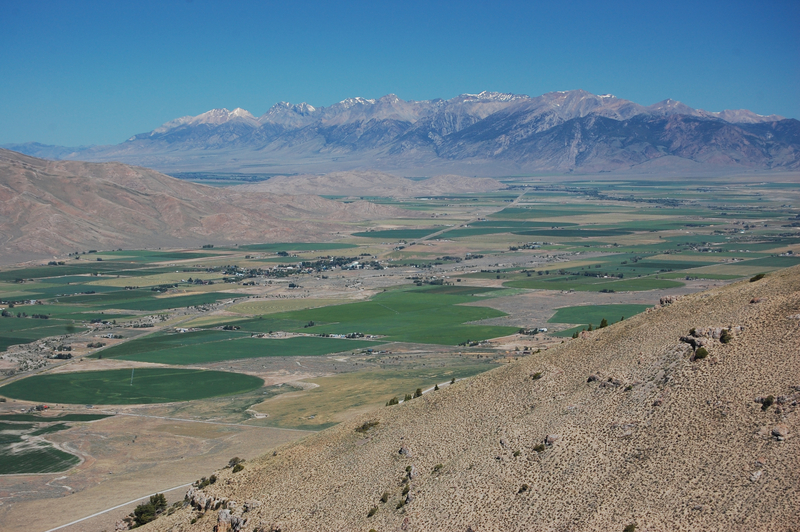 The Big Lost River Valley and the northern Big Lost River Mountains seen from Arco Peak in 2012. 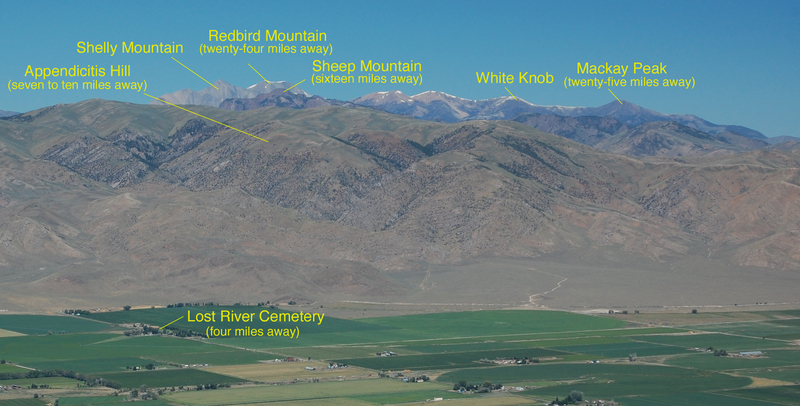 A view west from Arco Peak to Sheep, Shelly, Redbird, and White Knob, unlabeled and labeled. The excavation on Sunset Drive / Aikele Road / 2500N: images and geological inference (an 11MB jpeg). Number Hill from the side and a snowy Smiley Mountain in June 2017. Smiley Mountain (in the center) and other peaks from Number Hill. A sunrise view from Number Hill of the Big Lost River Valley and Smiley Mountain in July 2017. The B from the top of Number Hill . 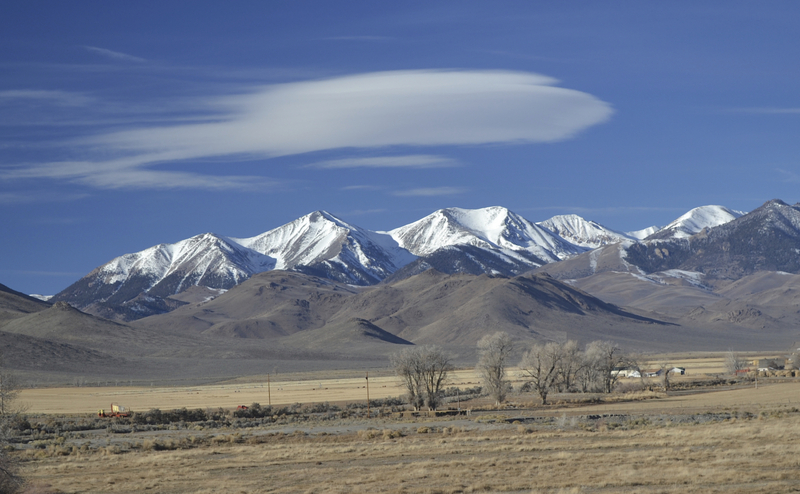 Both the B and the pointed top of Arco Peak are visible to the upper right. The east side of Number Hill. Arco and Number Hill seen from the B in 2017. Arco seen from Number Hill in 2011. 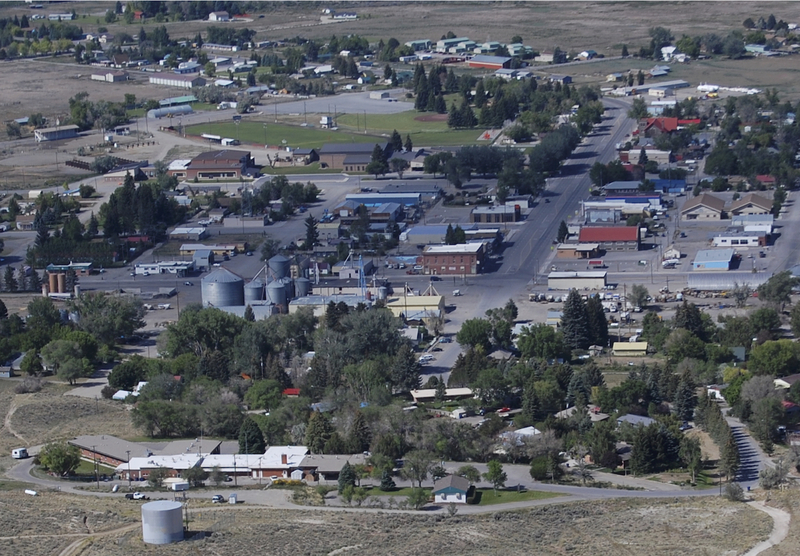 A more detailed view of Arco from Number Hill in 2012. Timbered Dome on July 1, 2016, three days before the fire, as seen from Bathtub Hill east of Arco. Timbered Dome from the south in 2018. 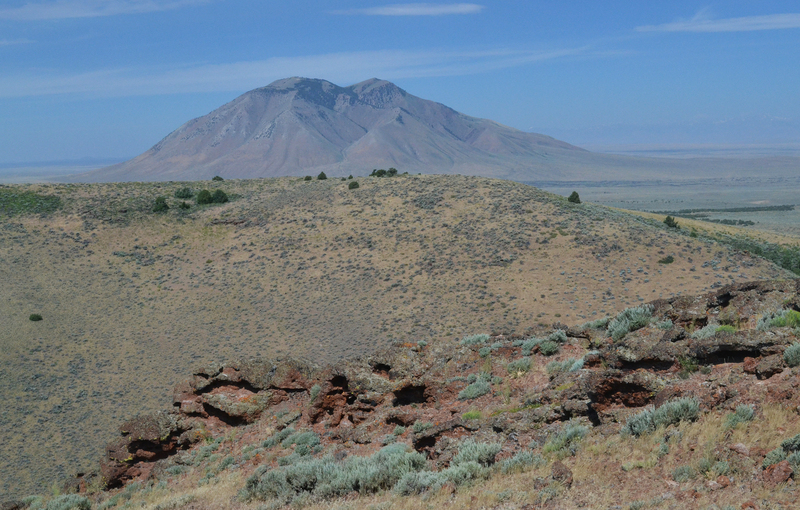 The Big Butte seen from the canyon behind Number Hill. The Big Butte from above the A. Bathtub Hill is in the foreground, and Cedar Butte is the smaller feature to the left of the Big Butte. 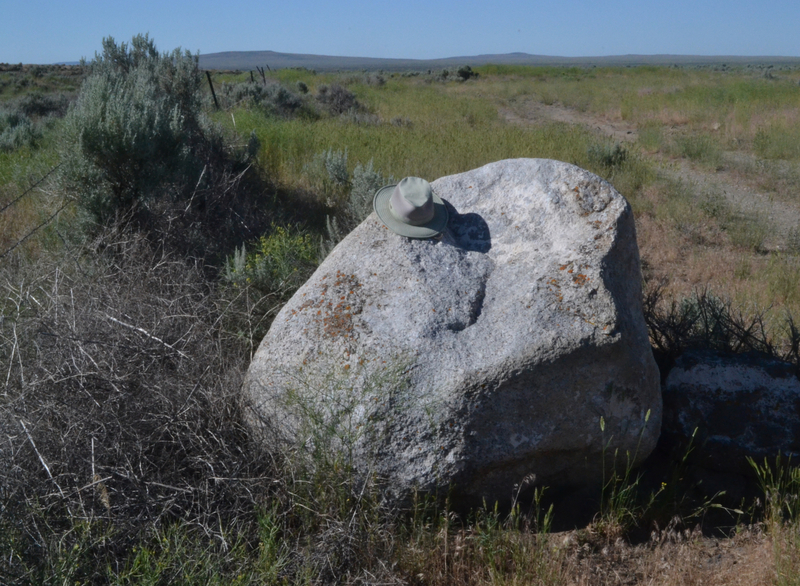 A large white granitic boulder from far up the Big Lost River Valley but sitting southeast of Arco and deposited in the Pleistocene megaflood of the Big Lost River. 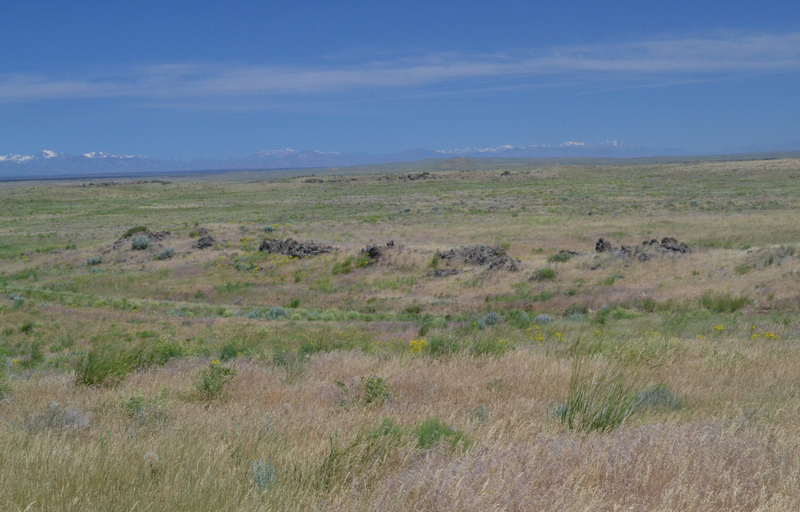 Sixmile and Wildhorse Buttes are visible on the horizon. 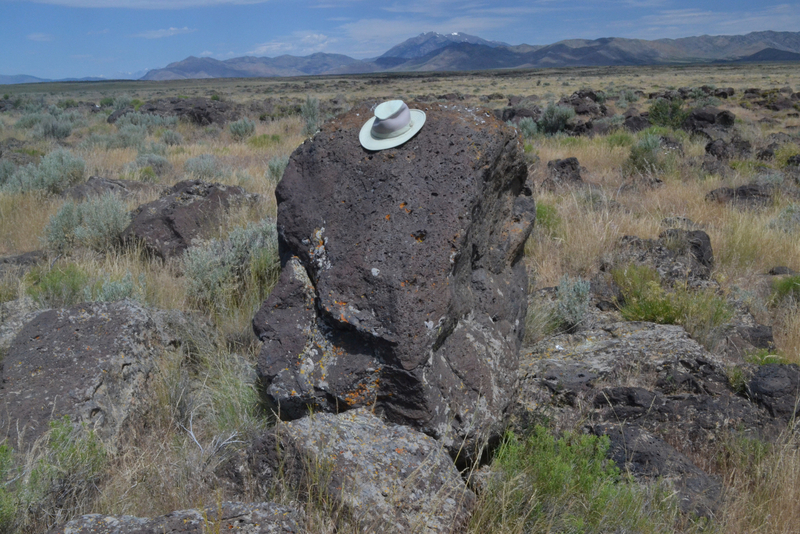 A basalt boulder deposited in the Pleistocene megaflood of the Big Lost River. 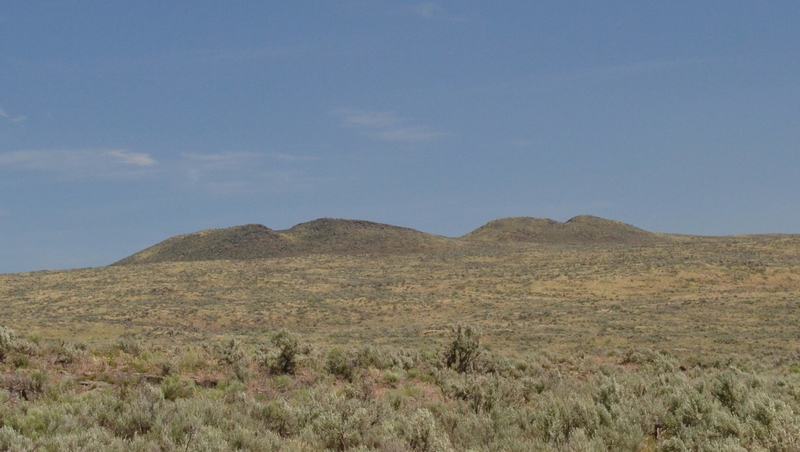 Tea Kettle (or Teakettle) Butte seen from the northeast. 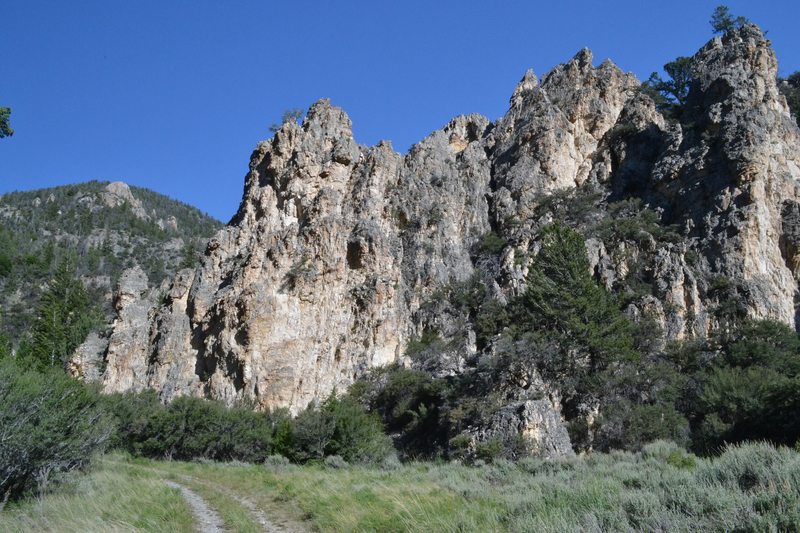 An instructive view looking upstream in the Box Canyon of the Big Lost River southeast of Arco. An aesthetic view looking upstream in the Box Canyon of the Big Lost River southeast of Arco in the wet summer of 2017. 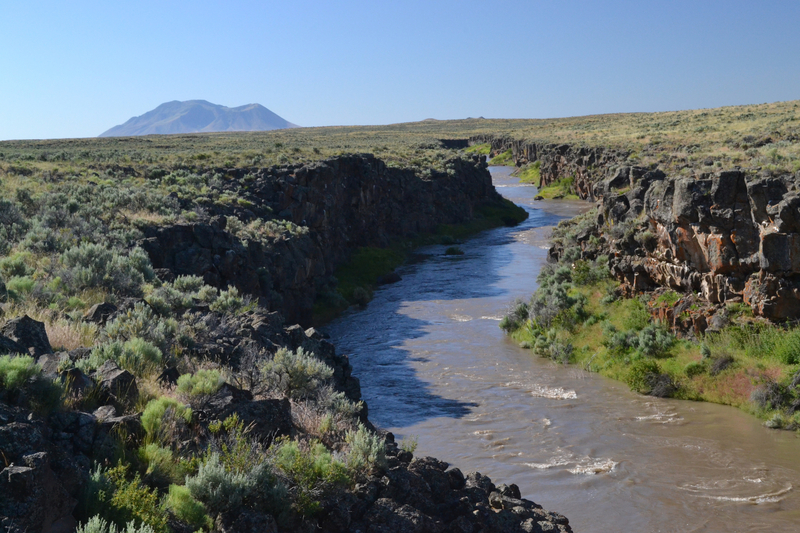 A view looking downstream in the Box Canyon of the Big Lost River toward the Big Butte in the wet summer of 2017. Ponds made by the Big Lost River near the Big Butte during the wet early June of 2018. 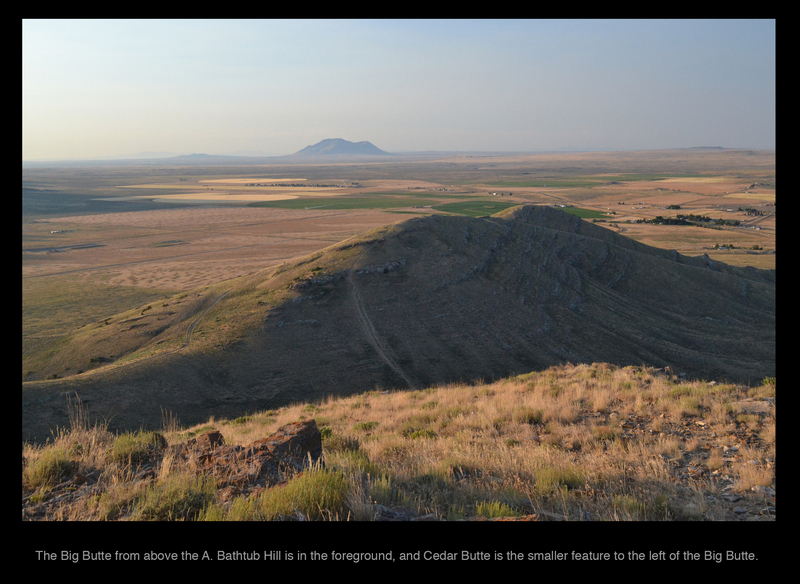 A view looking north from the Big Butte. 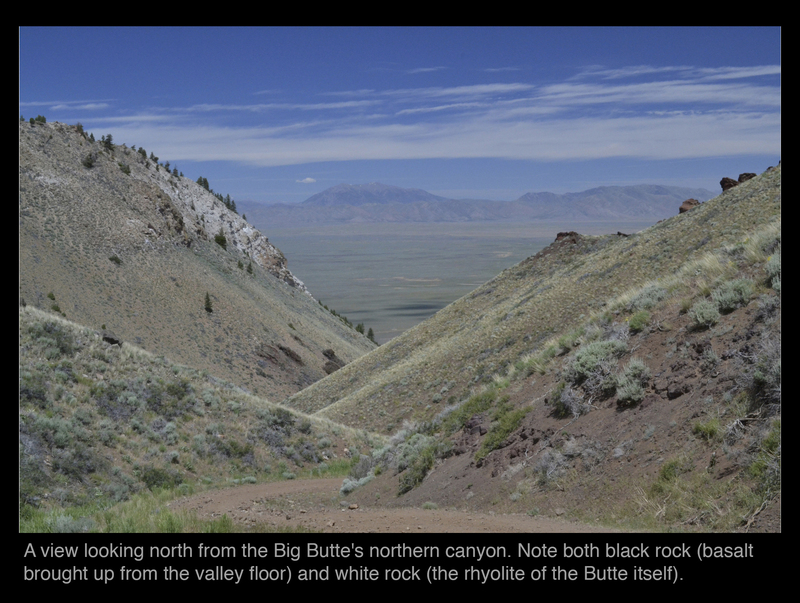 Note both black rock (basalt brought up from the valley floor) and white rock (the rhyolite of the Butte itself). 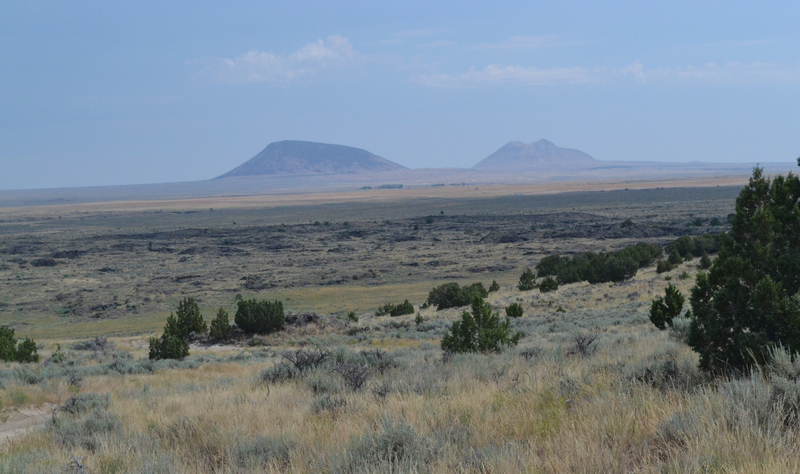 Cedar Butte (left) and the lesser Cedar Buttelets seen from the north-northeast. 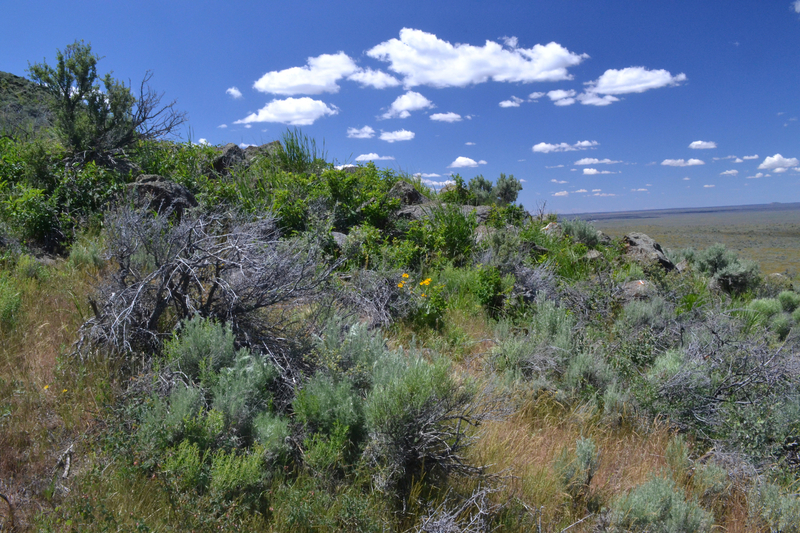 The summit of Cedar Butte. 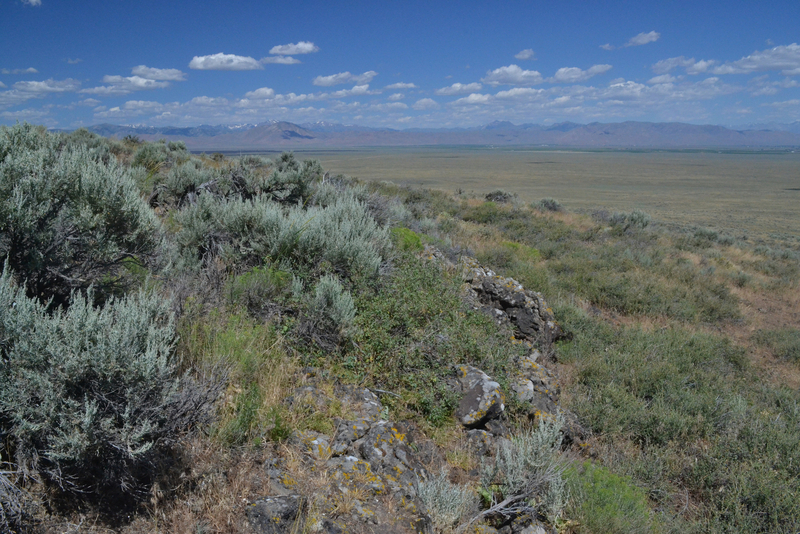 The view looking north from Cedar Butte toward the lesser Cedar Buttelets. 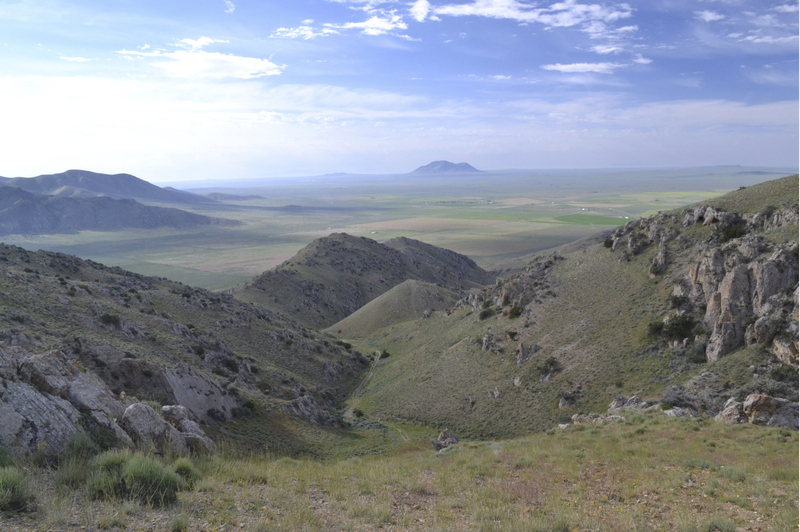 The Big Butte seen from the top of Cedar Butte. The view from Cedar Butte of the cedars that give it its name, the Cerro Grande Lava Field, and the Twin Buttes in the distance. 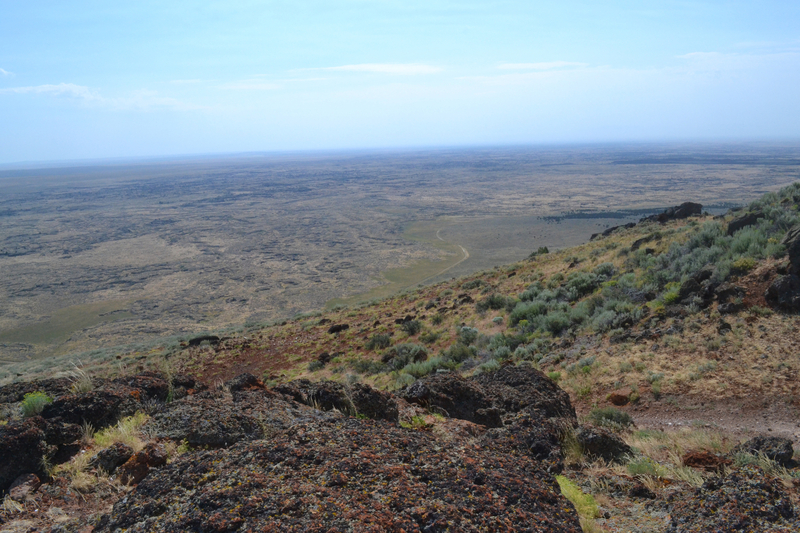 The view looking southeast from Cedar Butte over the Cerro Grande Lava Field. 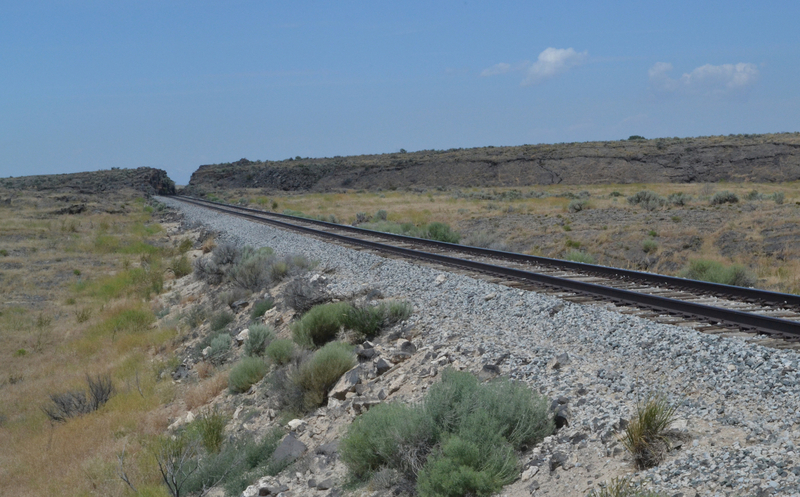 The railroad cut through a lava flow between Atomic City and Cedar Butte. 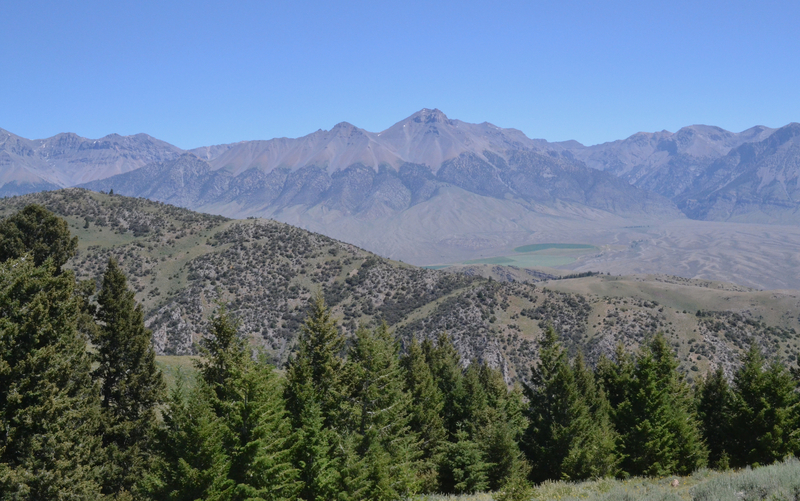 Arco Peak, King Mountain, and the westernmost ridge of the Arco Hills from Goodale's Cutoff (or traces thereof) south of Arco. 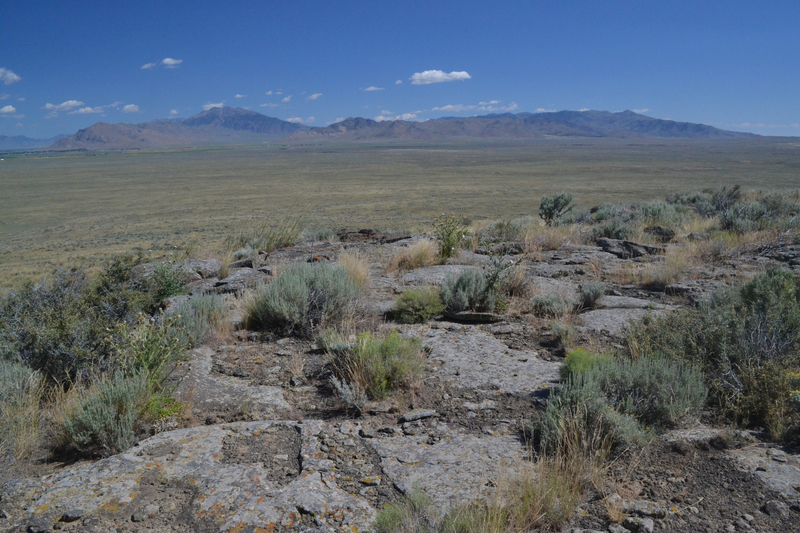 The basalt pavement of the surface of Sixmile Butte, and the view toward King Mountain and Arco at the far left. 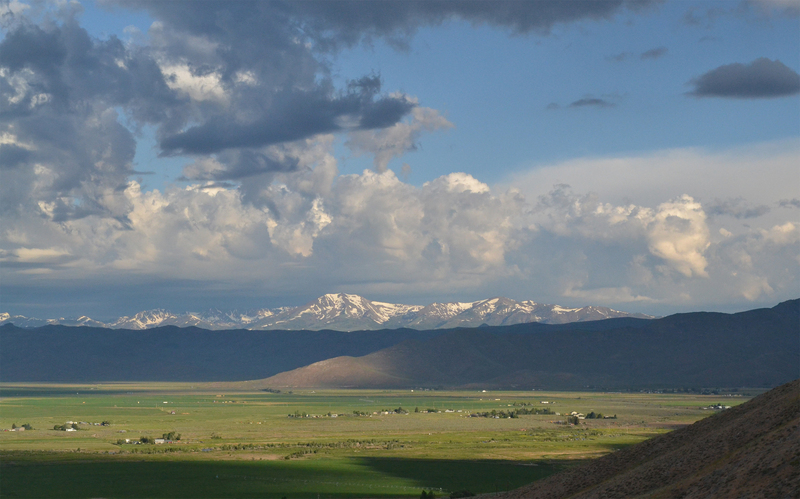 A less instructive but more aesthetic view from Sixmile Butte toward Arco Peak and King Mountain. 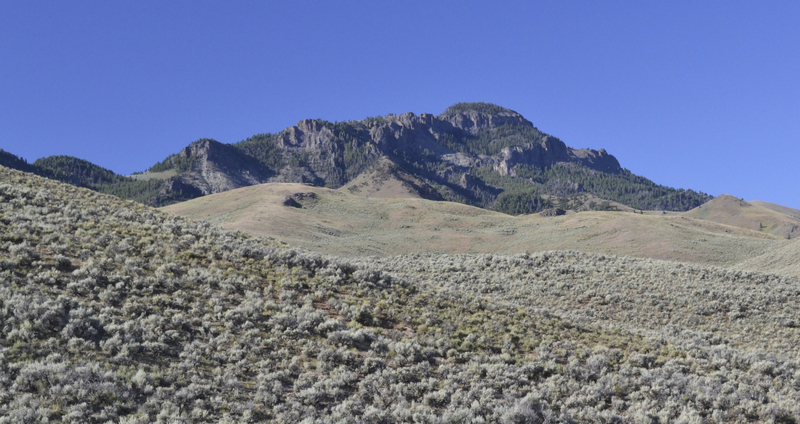 The north side of Sixmile Butte. 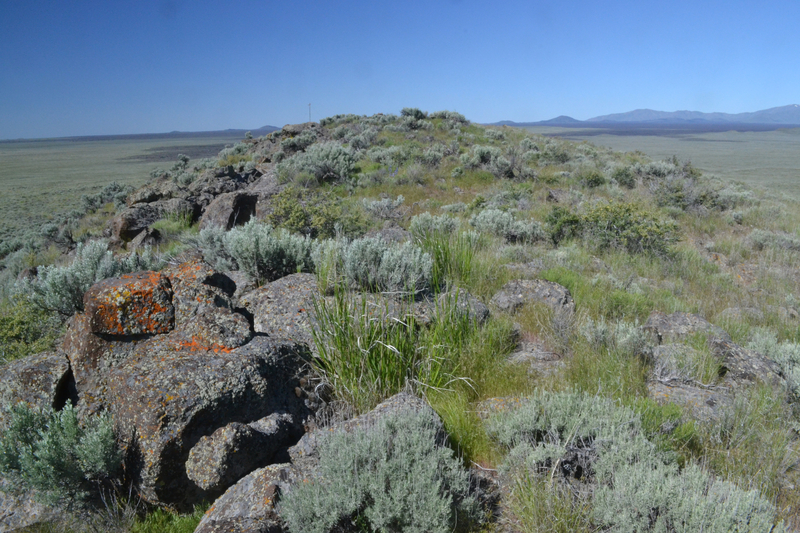 The top of Wildhorse Butte in 2018. 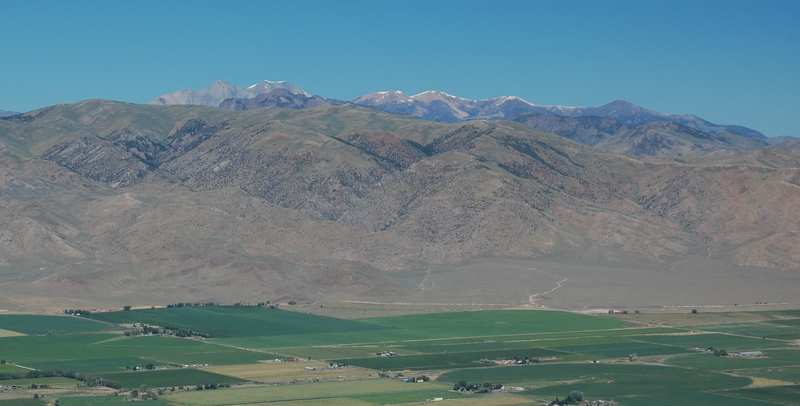 The view from Wildhorse Butte of Pass Creek, the southern Lost Rivers, Arco, King Mountain, peaks in the Lemhis, and the Arco Hills. Huddle's Hole (a kipuka) seen in the mid-right distance from Wildhorse Butte. Huddle's Hole (a kipuka) seen from its northern entrance. A view looking northwest from Quaking Aspen Butte of Fingers Butte, Timbered Dome, and the Pioneers. Quaking Aspen Butte seen from the west. The cairn atop Quaking Aspen Butte and the view to the west. The north side of Quaking Aspen Butte in the wet summer of 2017. 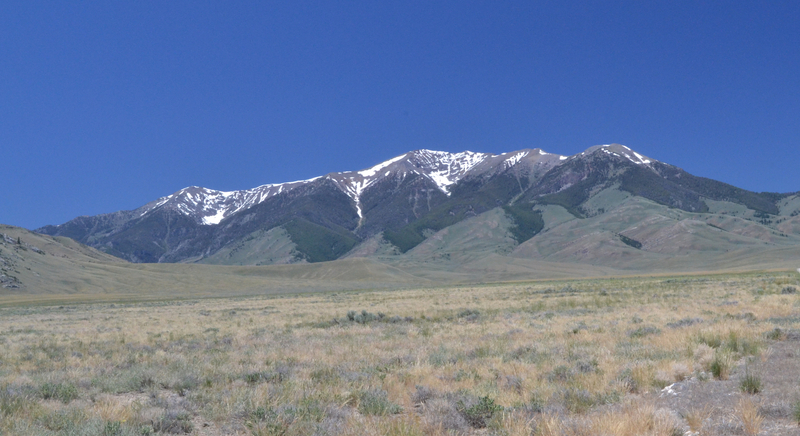 The Big Butte seen from the south, from near Cox's Well. The Cox's Well Landing Strip. A view looking north from south of Cox's Well. 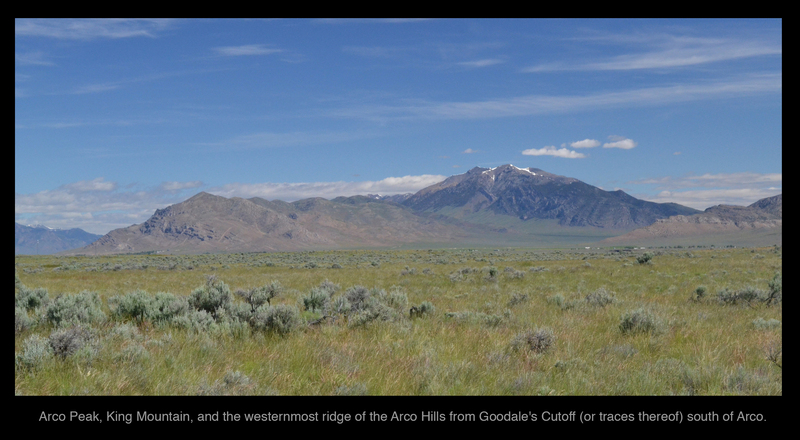 Southwest of Arco is Craters of the Moon, best represented by the National Park Service's Craters of the Moon website. 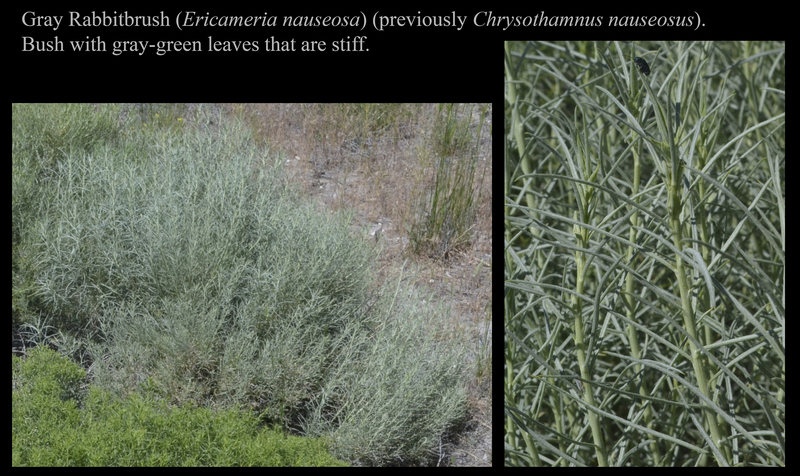 Green and gray rabbitbrush side-by-side. Fernbush or Desert Sweet or Tansy. 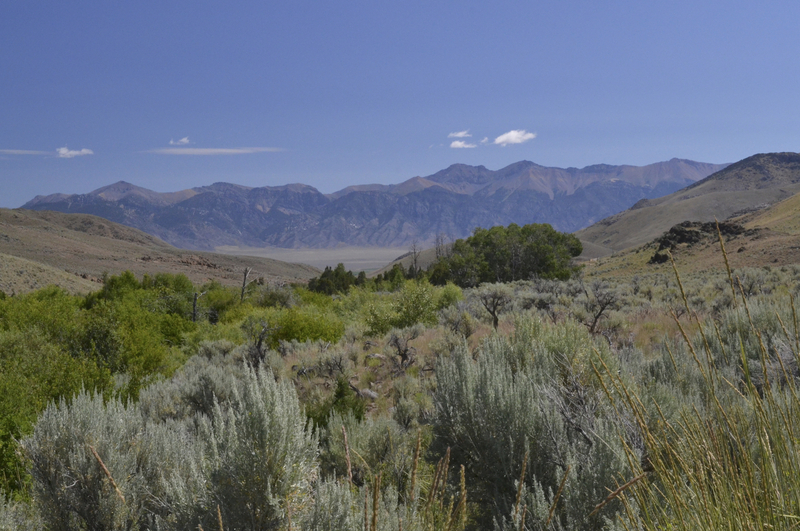 Photographs and descriptions of invasive plants: The documents linked here come from the website of Invasive Species of Idaho and specifically from https://invasivespecies.idaho.gov/terrestrial-plants. (3) Weeds to be contained to prevent new or expanding populations.